About 900 GPS stations, most of which are part of the Plate Boundary Observatory in the western United States, recorded the Earth’s surface response to snow and rain loading. The seasonal surface water thickness change in California is about 0.6 meters across the Sierra Nevada, Klamath and southern Cascade Mountains and about 0.1 meters eastward into the Great Basin and westward toward the Pacific Ocean. The GPS analysis indicates that seasonal water storage in the mountains is about 50% larger than some hydrology models for California, while a refined composite model that includes snow, soil moisture and reservoir water correlates better with the geospatial results. The solid Earth is elastic and deforms in response to a load of water, snow, ice, and atmosphere. The Plate Boundary Observatory (PBO) consists of over 1,100 GPS stations relatively densely spaced in California and other western states. The seasonal vertical changes in about 900 GPS sites (i.e., PBO and other stations) in California and Nevada that are affected by loading and not by aquifers were analyzed together to infer changes in total surface water throughout California. The results were compared to surface water models based on satellite data and hydrology models. 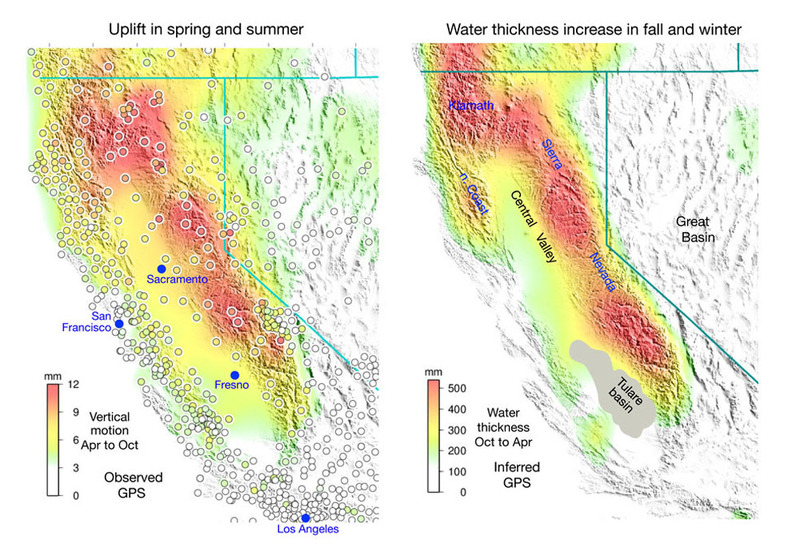 GPS resolves seasonal water storage in California’s different physiographic regions very well. Lots of water is stored in the mountains in the fall and winter, where the surface rises between 8-12 millimeters, while the Great Basin and the coastal regions store less water with surface rises of 2 millimeters or less. The GPS measurements are generally consistent with the seasonal changes observed by the Gravity Recovery and Climate Experiment (GRACE) mission. The GPS results provide much greater spatial resolution than the satellite data and thus provide more information about water distribution for water resource management. The GPS data are compared to three hydrological models: North American Global Land Assimilation System (NLDAS-Noah), Global Land Data Assimilation System (GLDAS-Noah) and a composite model. The GPS data helps to refine hydrological models and the comparison here suggests that NLDAS-Noah underestimates seasonal water storage in the mountains by about 50% while a composite model which includes snow, soil moisture and reservoir water is closer to the GPS results. 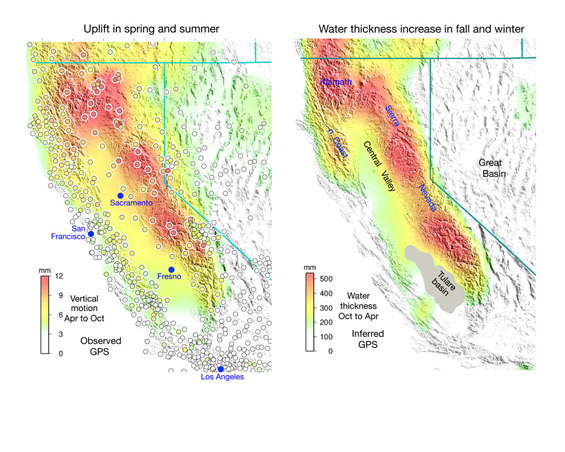 Argus, D. F., Y. Fu, and F. W. Landerer, (2014), Seasonal variation in total water storage in California inferred from GPS observations of vertical land motion, Geophys. Res. Lett., 41, doi:10.1002/2014GL059570.